GRANDE POINTE, Man. — Keystone Western has named Dave Davis its new president, while former president Norm Curtis moves into the CEO role. 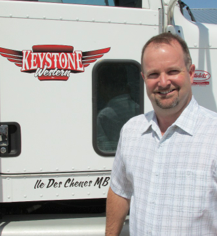 Davis joined Keystone Western on Apr. 6 and previously served in management roles with carriers including Wildwood Transport and Canada Cartage. As CEO, Curtis said he’ll focus on developing new business opportunities and managing the company’s rolling stock. Trucker Josh works for Keystone!! Along with Diesel and Seargent of course!